Recommended travel insurance - Which to choose? Travelex Travel Insurance is part of the Travelex Group, the world's leader of foreign exchange services. In North America, they're are also leaders in the travel insurance market. They offer a wide range of different insurance plans, in order to meet the needs of everyone, and every part of you travel can be insured. Available for US and Canada citizens only. Allianz Travel Insurance is the travel insurance program of Allianz, the largest insurance company in the world. The cost of a basic plan, including medical protection up to $10,000 and covering, among other things, baggage damage, baggage delay, and trip delay, starts from $20. 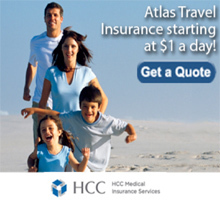 Atlas Travel Insurance is one of the biggest companies in the world specializing in travel insurance. Prices vary according to three factors: age of the insured, deductible and coverage amount. For instance, a young guy would pay from $11 for a two weeks holiday to Japan. Available for people living in any country in the world, including Thailand, Singapore, Malaysia, Hong Kong, Indonesia, Philippines.